To access our leaked copy of the secret “Resettlement Action Plan” refer to the base of this report. The “Resettlement Action Plan” for the Penan communities due to be flooded by the Murum Dam should have been released BEFORE building started on the site. According to international human rights protocols, the Penan ought to have been fully consulted and in agreement with the details of any move and they should have received guarantees about the lands, money and community services they could expect from the resettlement IN ADVANCE. 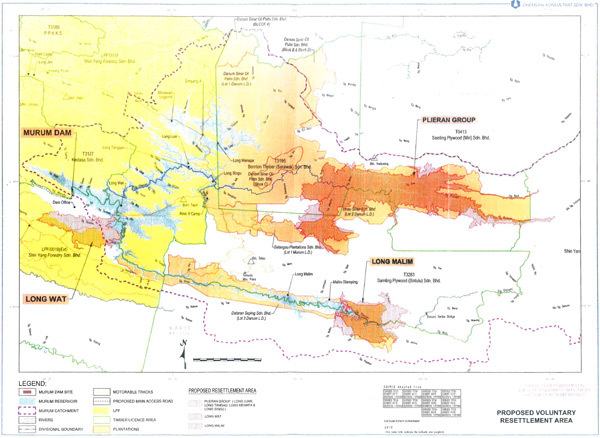 However, just months before the scheduled flooding of their lands this information has still been kept secret. There has been no negotiation, no disclosure, no agreement, no guarantees and no information whatsoever about the fate to befall these ancient indigenous peoples of the region that Taib Mahmud has decided to exploit and then destroy. Crucially there has been no genuine analysis of WHY a dam is needed at Murum in the first place! The new Bakun Dam means there is a dramatic excess of power in Sarawak, which the state is in no position to utilise for the foreseeable future. 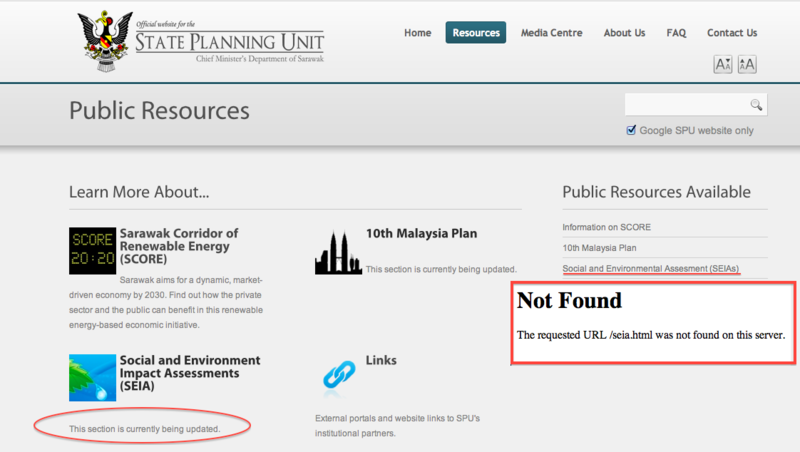 The report itself claims that it is available for all to see on the state government’s own website. However, it has never been made available and that website is currently stating that this section is ‘being updated’! Not available and being ‘updated’. The state government website where it is claimed this information should be made available. Only now are we able to release the details of what is planned, because we have received a leaked copy of this resettlement report. The report seeks to follow the protocols that Sarawak should have abided by, but of course this action is several years too late! Scandalously, under the section marked “Project Alternatives” the report admits “no project alternatives were considered because the construction of MDHEP[Murum Dam HydroElectric Project] had already commenced at the time of the report writing”! Clearly the reason Taib kept the project a dark secret was because he feared the reaction of the world if his plans to obliterate the homeland of the famous Western Penan (one of Asia’s last remaining jungle tribes) became public. Now he laughs that it is all too late. His cronies have stripped the area of its valuable timber and started vast oil palm plantations in the region and his companies like CMS and Sarawak Cable have made huge fortunes in contracts. However, the details that have been made public in this now pointless resettlement report will come back to haunt Taib Mahmud and his reputation for all time. In painful detail the report officially records the appalling neglect by this despot of the most vulnerable people in the state. The Penan have suffered the loss of their jungles, their livelihoods and their culture to his greedy plunder first of their timber and then of their lands. In return the report admits that they have received almost zero assistance as they have struggled to survive in their lands stripped of sustenance! This logging was done in the name of ‘Progress and Development” by Taib, who promised that it would make the people better off, but the report makes clear that whereas before the Penan had forest products to live off, now they have nothing to live off. The “Resettlement Action Plan” reveals the desperate poverty of the Penan following the logging of their forests by Taib Mahmud. 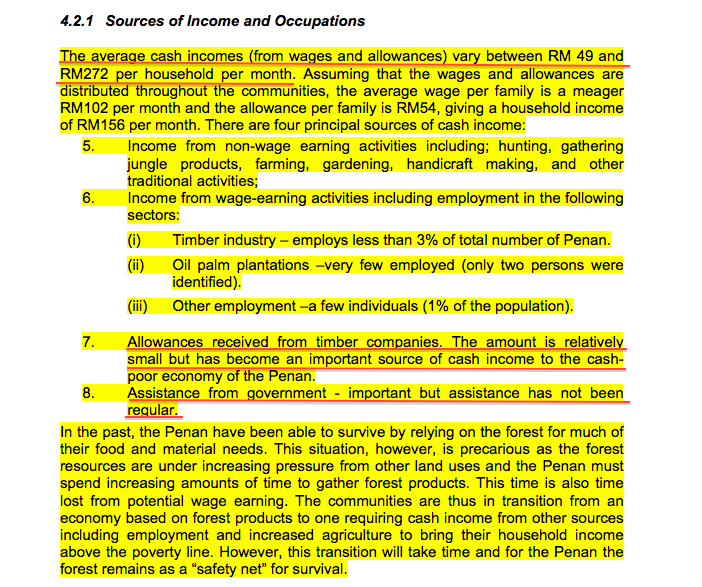 Shockingly the report details how the Penan currently receive an average income of a mere RM154 per family a month, with some surviving on just RM49 per month, “well below the official rural poverty line index of RM830 a month”, acknowledges the report. 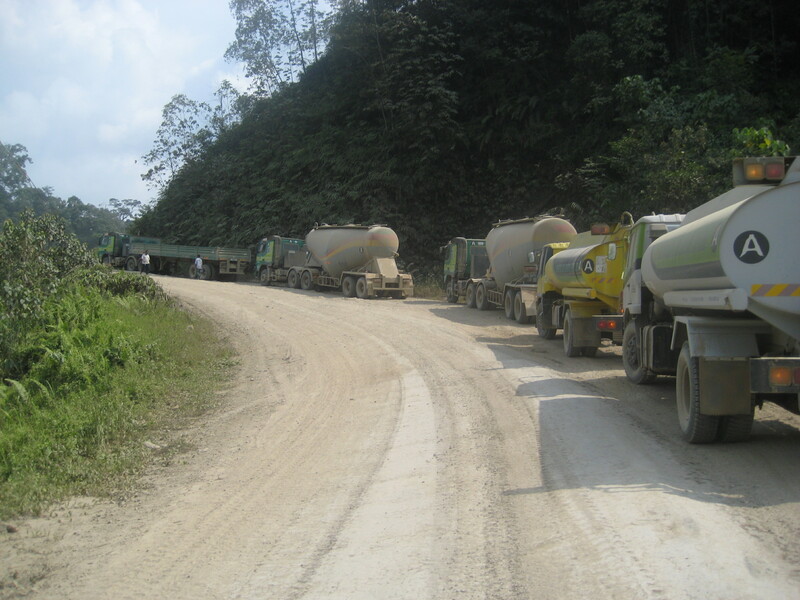 “the logging companies have gained “permission” through the payment of allowances to the community headmen. Outrageously, the report acknowledges that “assistance from government” is an “important” source of income for these deprived people, but it openly admits that “assistance has not been regular”! 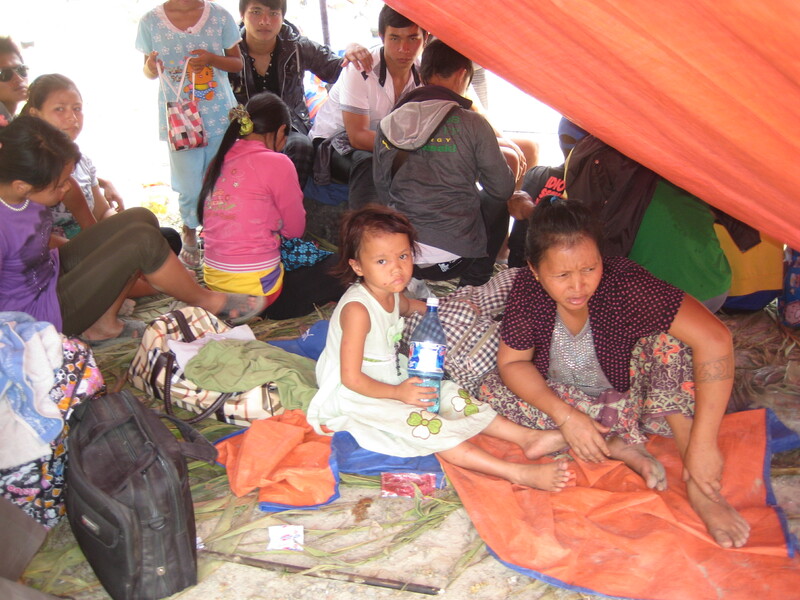 Indeed no such assistance is included in the recorded monthly income of these Western Penan people! What ‘progress and development’ can Taib Mahmud possibly point to for the Penan in return for the destruction of the forests and their indigenous way of life, if thirty years after he began his ruthless, unsustainable logging in their area these people still do not have access to these basic facilities, let alone jobs or income? The Penan villagers (they were forced to settle into village life after the destruction of their jungles began in the 1980s) told a Sarawak Report reporter just last week that they have begged for teachers for many years to help their children, but that none have been sent. They also said that many of their women and babies die in childbirth because there is no maternity support. There is no medical assistance either and the medicines they once used from the jungle have been destroyed by the logging. The only explanation for this appalling neglect, which is catalogued in detail in this heart-rending 167 page report, is that Taib Mahmud has embarked on a ruthless policy of systematic ethnic genocide of the Penan people. What reason could he have, when so much money has been made from logging their lands? Is it because it was the protests of the Penan that exposed his pillage and destruction of the Borneo rainforest to the rest of the world? Is it because the easiest way to prevent any more obstacles to his plans to divert all of Sarawak’s resources into the enrichment of his own family is to allow the slow death of the people who are standing in his way? Likewise, the Penan explained to our reporter that the village girls are no longer able to make money from selling baskets and mats made from rotan, because there is no longer any to be found in the Murum region. The report says “for the Penan the forest remains as a “safety net” for survival”, yet that safety net is already virtually gone. These means there are no vegetables to gather, no animals to hunt and the rivers are so polluted from the logging that there are no fish to eat in this environmental disaster zone of Taib Mahmud’s own making. No identity, so the Penan do not even officially exist! Possibly even more disgraceful has been the Chief Minister’s neglect in even acknowledging the official existence of the Penan as human beings existing in the state. This is even though they have lived in Sarawak far longer than many others who have been accorded their identity cards that give them the right to livelihood and the right to vote. This lack of official status, the report admits, has made it virtually impossible for the Penan to find jobs in the wider economy. Yet the report fails to explain how it could be that a government agency can register people as not having been given IC cards without at the same time rectifying this error! Is it because the Chief Minister is already willing these troublesome people to cease to exist or is it because he knows that if they obtain the right to vote they will vote heavily against him? No IC cards, so no chance to get jobs or state assistance and no chance to vote! Why is it Taib can ‘count’ these people but he cannot give them their rightful status? At the same time Sarawak Report queries the figures laid out in the Action Plan report, because we believe it seriously underestimates the true numbers of the Western Penan who are stranded in the Murum area. Our observers said that their visit made clear there are many many more people involved in this tragedy than the 1,500 referred to in the official figures. 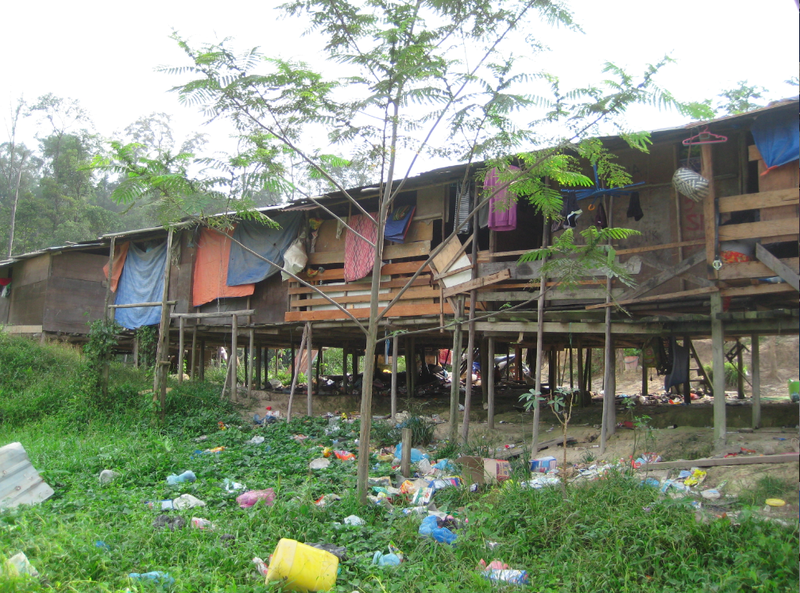 They in fact estimate that there are up to 40 people living to each door in the existing longhouses. The Resettlement Action Report is, of course, full of promises. There are promises of new lands (14 hectares to farm per family), new homes, schools, medical facilities, transport and services like water and electricity. However, what use are such promises when just a few months before the inundation of the dam nothing has been built and nothing signed? Promises, but no guarantees. 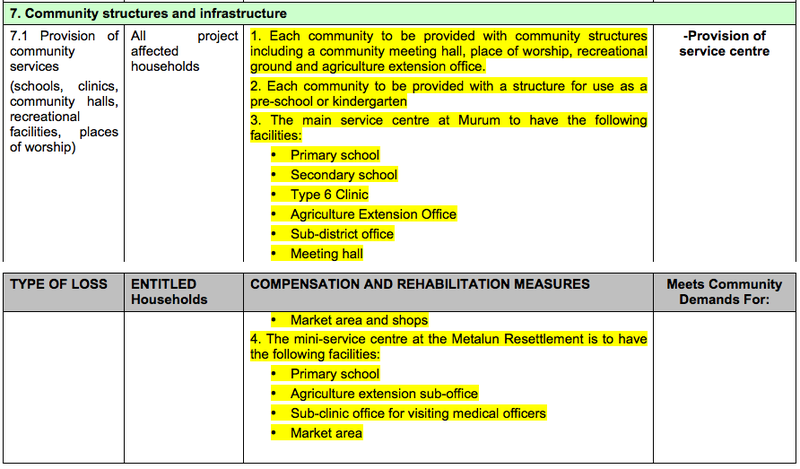 Why have these not been fully negotiated with the Penan and what titles and proof do the communities have that any of these facilities will be provided or that they will be free? 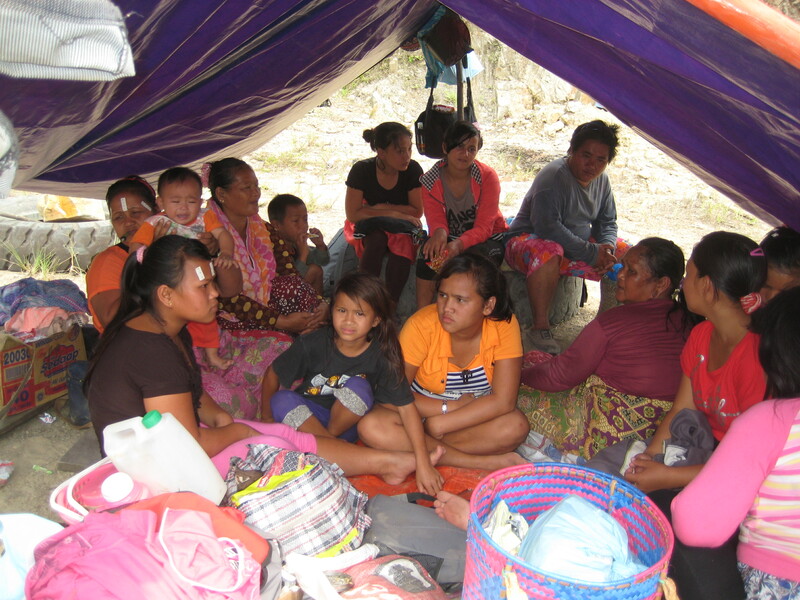 As the people displaced to Sungai Asap by the Bakun Dam can testify, such promises are worth nothing! 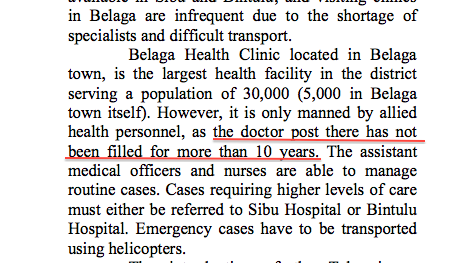 Their main clinic in Belaga still has no resident doctor to support the health needs of 10,000 displaced people. And what use are electricity and running water to a community living off RM500 a month? They would never be able to afford the bills, which is the very predicament facing so many of the families who have already been moved by the Batang Ai dam (some 25 years ago) and the Bakun Dam, who have been cut off from these services. The replacement promises outlined in this report are valueless. Nothing reveals this more shockingly than our revelation that the lands to which the Penan are to be displaced (without any negotiation or choice) have also been simultaneously handed over to Taib’s crony oil palm plantation companies! 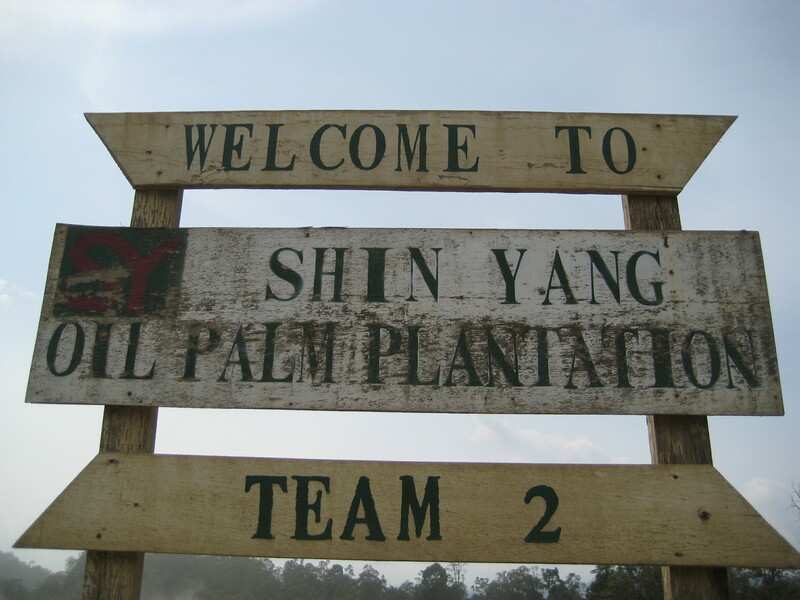 Villagers who were taken up to see their ‘resettlement zone’ told our reporters that the earth was already flattened and stripped bare and was being planted with oil palm. Even if they do manage to keep any acres after confronting these plantation owners, they have still received none of the promised help and assistance in developing the agricultural skills to grow food. Neither is there any secure on-going provision for grants for fertilisers or other necessary products to enable them to raise crops on this notoriously infertile jungle soil. On a grant of just RM500 a month in an area so distant from people that they will never be able to market their agricultural products the Penan as farmers simply would not be able to survive. The strong suspicion must therefore be that this is exactly what Taib Mahmud, who heads the Ministry of Planning and Resources in charge of the Murum Dam and in charge of this resettlement, is intending. Brought to a halt! Taib’s monopoly of cement through his company CMSB has brought him immense wealth through the building of dams. 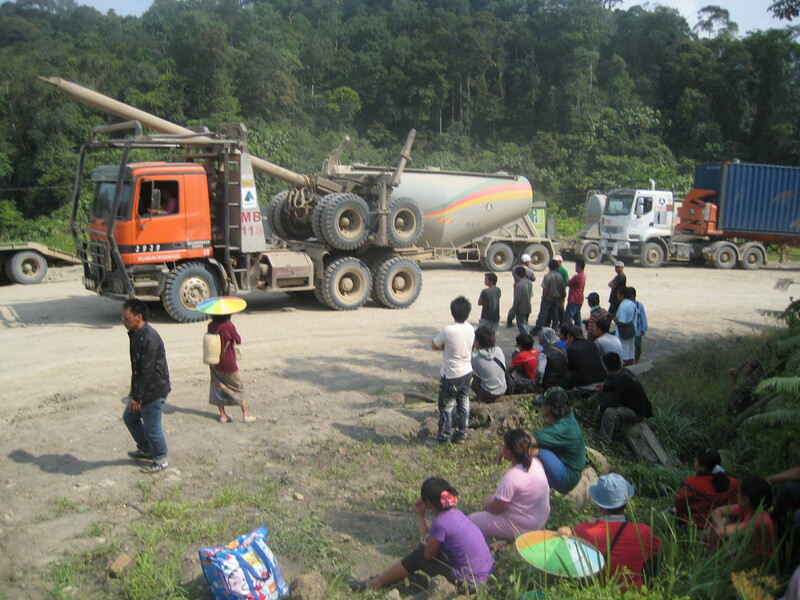 Today the Western Penan of Murum are mounting a blockade against the huge lorries which have been driving through their lands, removing earth and pouring in cement into their once sacred area. For years they have watched powerless and have been kept in ignorance about their future. But now, with the release of the details of this secret Resettlement Action Report, they can see that their future will be hopeless once their villages are flooded. The people of Malaysia should voice their support and to help sustain these people as they face the builders and the police and a Chief Minister who wants them wiped away from the face of the earth. To support the campaign to help the survival of the Penan join our appeal and donate to our Penan Support Fund. We demand that the human rights of the indigenous Penan people of the Murum area are respected during the remaining construction of this dam project. After over 5 years of disruption they have still received no compensation or recognition of their rights, during a period when their forests have been felled and their livelihoods and cultural heritage destroyed. We demand immediate action to help these people who are starving at the hands of their own government. We demand immediate recognition of their rights of basic citizenship, including the issuing of Identity Cards and voter registration. We demand that compensation and resettlement issues are openly and fairly negotiated with proper professional representation being made available to the Penan communities in the form of a full time legal team of advisors. We demand that all work on the dam is stopped until these conditions have been met and until the social and environmental impact assessments have been published and discussed. We demand that work should not resume on the dam unless there is full and proper agreement that key criteria are met by the project - these are that there is an agreed need and purpose for the dam, that the destruction caused by the dam is proportionate to any perceived need, that there are no corruption issues with respect to the commissioning of the dam and that the environmental and social impacts are justifiable and mitigated as much as possible in this extremely sensitive area and that the human and indigenous rights of the Penan people and other natives residing in the area have been fully recognised and their losses fully compensated in agreement with them. These demands are made in line with the expectations of UN protocols on human and indigenous rights and the protocols of the International Hydropower Association of which Sarawak Energy is now a Board Member. Whither Freedom of the Press?